Join us at the nation’s largest medtech design and manufacturing event and connect to the inspiration, partnerships, education and technologies that drive medical device innovation. In this last Newsletter of 2013, I would like to thank you all for making the year end on such a high. It has not been an easy year but by working hard we managed to all join forces to build the Telesis brand, to sell our great products and to ensure that our customers received the best possible service. 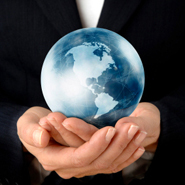 Telesis is ready for the future with new innovative products to be released in 2014. We have ambitious plans for the New Year with the emphasis on customer relations and after sales. Find the education, suppliers, thought-leaders, inspiration, and tools medical device development professionals need to innovate and thrive. Fremont, CA – October 01, 2013 -- Telesis Technologies Inc. is a world leader in manufacturing standard and customized permanent parts marking equipment and systems—including gas, solid state and fiber laser, mechanical PinStamp®, BenchMark® dot-peen systems and TeleScribe® scribe marking systems. 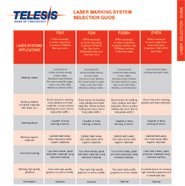 Since 1971, Telesis has provided durable and accurate parts marking capabilities to companies the world over, from small shops to Fortune 100 manufacturing firms and governmental organizations. 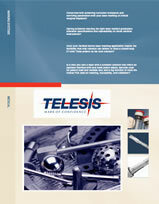 Telesis continues to be the most trusted brand in the parts-marking industry for over four decades. For more information on Telesis Technologies Inc., visit us at South-Tec , booth 726, TD Convention Center, Greenville SC, October 29-31 2013. If you haven't registered yet, register today for your complimentary registration, and be sure to visit us in booth 726. Fremont, CA – July 01, 2013 -- In this issue: Message from René van der Toorn, General Manager Telesis Europe B.V. - Benvenuto Encoding Italia! Fremont, CA – July 22, 2013 -- Telesis laser marking system increases golf club marking productivity by 20%, connects to ERP system to eliminate manual keying errors and associated waste, while cutting automation footprint by 50%. Introducing Encoding Srl, a Yellow & Yellow Company. Fremont, CA – April 18, 2013 -- In order to distribute and support Telesis the wide range of permanent, programmable Laser and Pinstamp Marking Systems in Italy, our partner Yellow & Yellow Srl has founded a new dedicated company: Encoding Srl. Fremont, CA – March 05, 2013 -- A custom, flexible laser marking system marks medical devices, checks quality, and connects to front- and back-office production and inventory systems. Although laser marking may seem a straightforward task when compared, for instance, to developing wrist implants or artificial hips, poor marking systems can introduce pinch points in the manufacturing process or even stop the line entirely in the event of failure. Fremont, CA – January 31, 2013 -- The SR1911, along with all other Ruger semi-automatic handguns, is manufactured at the company's 240,000 square foot manufacturing facility in Prescott, Arizona. To meet ATF regulations, Ruger has to ensure that the finished products are all properly marked with the firearm's model, caliber, manufacturer, serial number, and other details. For years, these marks have been made by roll-marking (a process in which identifying marks are machine-stamped into the parts to be marked). Sturm Ruger manufacturing hits the mark with Telesis ProStation integrated laser marking systems. Fremont, CA – January 07, 2013 -- The Nov/Dec 2012 issue of Industrial Laser Solutions showcases how Telesis Laser Markers improve the company’s profit margin by savings in maintenance, labor and set-up in their manufacturing lines, while adding flexibility and 24/7 reliability.